Procera® XTF extreme focus is ideal for those high-pressure moments when you need a mental boost—whether in the classroom, the boardroom, or on the basketball court. What makes Procera® XTF extreme focus so effective? First, it includes the Procera AVH® ingredients, plus additional performance-boosting and stress-fighting ingredients, including Rhodiola rosea and important B vitamins that are often depleted by exhausting mental challenges or stress. The balance of B vitamins in Procera® XTF extreme focus also helps to sustain sufficient neurotransmitter levels for optimal mental performance. And, just like that cup of joe, Procera® XTF extreme focus has an immediate effect due to natural sources of caffeine, such as green tea and guarana bean extracts. These moderate amounts of caffeine work synergistically with several of the ingredients in XTF, especially vinpocetine, a natural extract derived from the periwinkle flower that is known to support brain circulation, delivering much needed oxygen, glucose and other vital nutrients to the brain. In short, it gives you what you need for highest cognitive performance, but without having to pay for it later on. Procera® XTF extreme focus is derived from many of the same ingredients as Procera AVH®, our flagship product with millions of units sold. In fact, Procera AVH®'s three ingredients were selected out of dozens of nature's best brain nutrients that were tested on thousands of subjects, with the top three in the product name, A-V-H.
Procera® XTF extreme focus helps support the brain’s energy, or cerebral metabolism, which helps support brain function and cognitive performance. 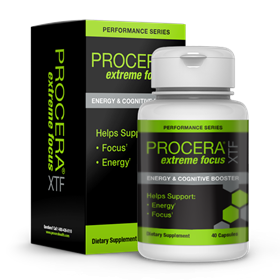 Procera® XTF extreme focus also helps support key neurotransmitters, such as acetylcholine and dopamine (for sharper, more sustainable focus), which can be depleted by stress, sleep loss, poor diet, other physical problems and conditions. Procera XTF® provides a special cognitive edge. Acetyl-l-Carnitine is a neurotransmitter enhancer that supports brain blood flow and circulation, boosts nerve growth, and improves mitochondria function. As an elevator of the brain’s acetylcholine (Ach) levels, this ingredient—naturally produced by the body and found in fish—helps support cognitive health. Vinpocetine is a critical ingredient that supports brain health and cognitive function. Derived from the natural extracts of several plants, including the Periwinkle flower (the ‘immortality flower’) it helps support blood flow to and throughout the brain, raising oxygen levels and boosting cerebral metabolism. Huperzine is a natural acetylcholinesterase (AChE) inhibitor. AChE is the enzyme that destroys acetylcholine in the synapse before it’s effectively used to help you form your thoughts, feelings and memories. Derived from Chinese Club Moss (Huperia serrata), HUP helps keep your acetylcholine levels up, so your synapses can fire quickly and efficiently. Rhodiola rosea is considered a potent adaptogen, which means it helps keep the brain and body's neuro-transmitters and hormones in balance under extreme mental and physical stress conditions. Natural Sources of Caffeine, which include green tea and guarana bean extracts. Caffeine works synergistically with several of the ingredients in Procera XTF® extreme focus.